Loved FRIEND REQUEST? Laura Marshall's sensational new thriller, THREE LITTLE LIES, is available now in hardback, ebook and audio. Maybe that had been the problem all along: Maria Weston had wanted to be friends with me, but I let her down. She's been hovering at the edge of my consciousness for all of my adult life, although I've been good at keeping her out, just a blurred shadow in the corner of my eye, almost but not quite out of sight. Maria Weston wants to be friends. But Maria Weston has been dead for more than twenty-five years. THE ADDICTIVE PSYCHOLOGICAL THRILLER THAT EVERYONE'S RAVING ABOUT - perfect for fans of He Said/She Said, The Couple Next Door and I See You. Laura Marshall grew up in Wiltshire and studied English at the University of Sussex. 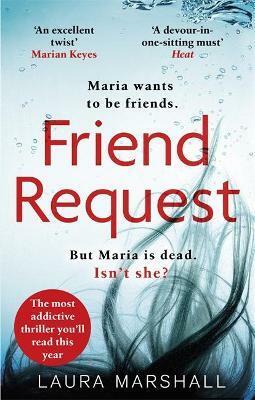 Her debut, Friend Request, was a Kindle No.1 and Sunday Times bestseller, with over half a million copies sold in the UK. It has sold in a further twenty territories around the world, and was also shortlisted for the Bath Novel Award and Lucy Cavendish Fiction Prize in 2016. Three Little Lies is Laura's second novel. For more information visit Laura's website www.lauramarshall.co.uk or find her at www.facebook.com/lauramarshallauthor or on Twitter @laurajm8.